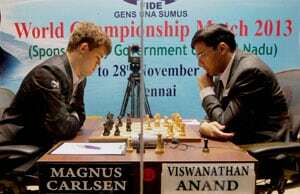 Viswanathan Anand gave nothing away to Magnus Carlsen who played white and was expected to push harder with his two points lead. When asked if the choice of King pawn opening by Carlsen was a surprise Anand said no. Time might be running out and the throne slipping away but defending champion Viswanathan Anand made it clear that he will come back harder in the next game after drawing the eighth tie of the World Chess Championship rather easily, here on Tuesday. "Of course the match situation explains itself and I guess it's my job to liven things up but I guess I will try in the next game," Anand said in the post game conference. Anand gave nothing away to Carlsen who played white and was expected to push harder with his two points lead. When asked if the choice of King pawn opening by Carlsen was a surprise Anand said no. "In general in a match you should not be surprised, but I had not prioritized 'e4'," the defending champion said. Elaborating on the game, Anand said it was "generally a fairly solid system for white" but not entirely without chances if black played inaccurately. "The only may be interesting moment was if I go Qg5, h4 is strong but after just Qd8 we liquidate to a drawn ending," he said. When asked if he could have tried anyways, Anand said he had to be ready for all situations. "Obviously I had to be ready for any scenario that turned up but after d4 and c3 this is what I could do." Anand said he was not sure about a Sicilian defense, considered a combative opening. "I didn't know what really his intentions were, and even the Sicilian even if you want to play dry systems, they are available." Anand said he was happy with his opening preparation. "I am quite happy with my opening preparation, get kind of a bonus evening before the rest day and so I will try and prepare something for the next one." Carlsen said he did not mind the result. "I didn't particularly mind the draw as was evident from my play, I was just hoping to set up one or two traps. I guess when you play matches its really different, there is still way to go but for now I am fine," he said. The Norwegian was asked if he had an idol. "I didn't have any particular idol in chess when I was young. As a young player I was also trying to play attacking chess. Sacrificing material all the time, bit different from my deeds today. I have been playing at top level for seven years. I have had some time to adjust to situation and develop my play accordingly," he said. The game was played at a frenzied pace by Carlsen using an average of about 30 seconds for the first 20 moves. "With the line I chose there was not too much to think about the moves, pretty much suggest themselves. It's basically more or less all been played before. I wasn't in any mood to think either so that influenced my decision," Carlsen said. The ninth game will now be played on Thursday after a day's rest.